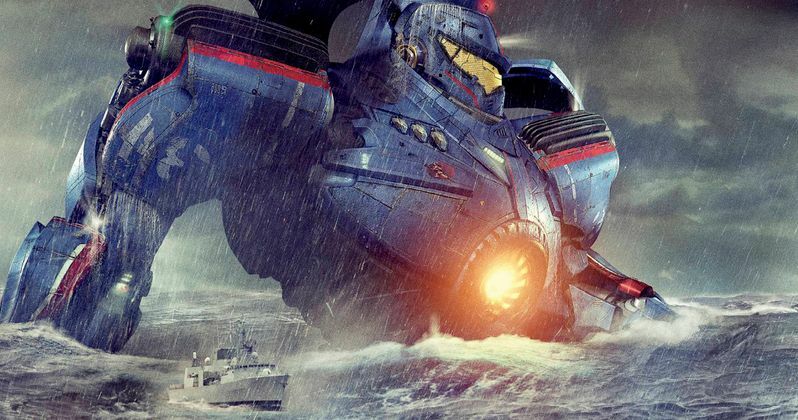 Back in September, a new report surfaced that Legendary's long-awaited sequel to Pacific Rim would start filming in November, but that was never confirmed by the studio. Today we have proof that filming has started today, thanks to star John Boyega, who sent out the first set photo featuring a script cover showcasing Pacific Rim 2's official title as Pacific Rim: Maelstrom. The actor wouldn't say more about the plot, but he did issue this brief statement. "First day on Pacific Rim today. Here's to a great adventure ahead." John Boyega is playing the son of Idris Elba's Stacker Pentecost from the original movie, along with new stars Scott Eastwood, Tian Jing, Levi Meaden and Cailee Spaeny. The cast of Pacific Rim: Maelstrom is also believed to include original Pacific Rim stars Ron Perlman (Hannibal Chau), Charlie Day (Dr. Newton Geiszler), Rinko Kikuchi (Mako Mori) and Burn Gorman (Gottleib), but they have not been confirmed yet. Now that filming is under way, hopefully a full cast list for Pacific Rim 2 will be released soon. It's possible that today's Instagram photo from John Boyega is the first of many to come from the set. Back in July, Charlie Hunnam confirmed that he will not be reprising his role as Raleigh Beckett, due to scheduling conflicts, but he added that he is still excited to see the sequel. No story details have been released for Pacific Rim 2 quite yet, but the first movie was set in a world where humanity was forced to build massive robots known as Jaegers, to fight giant monsters known as kaiju and stop them from destroying the entire planet. The original Pacific Rim earned $101.8 million domestically and $411 million worldwide, from a massive $190 million budget. There had been numerous reports that Legendary canceled the sequel, but that all changed when Legendary merged with Chinese investment firm Dalian Wanda Group. Pacific Rim earned more in China ($111.9 million) than any other market in the world. Previous reports confirmed that part of the production will be set in China. Stephen S. De Knight (Daredevil) is directing Pacific Rim: Maelstrom from a screenplay that has been worked on by Guillermo del Toro, Travis Beacham, Jon Spaihts, Emily Carmichael, Zak Penn, Kira Snyder and Derek Connolly. Universal has set a February 23, 2018 release date for Pacific Rim: Maelstrom, which is the only movie set for release on that date, falling between the release of 20th Century Fox's Larrikins (February 16, 2018) and Warner Bros.' shark thriller Meg (March 2, 2018). Take a look at the first set photo from Pacific Rim 2 below.